A woman held a child during the walk. Donna Forkey, who was homeless for 15 years, started participating in walks to lose weight — but mostly to give back. “I like giving back because when I was there and needed somebody, they helped me,” said Forkey, 59. More than 1,000 people registered to walk in the third annual Winter Walk, according to organizers. The crowd gathered in Copley Plaza early Sunday morning in an effort to raise money and awareness for people experiencing homelessness. 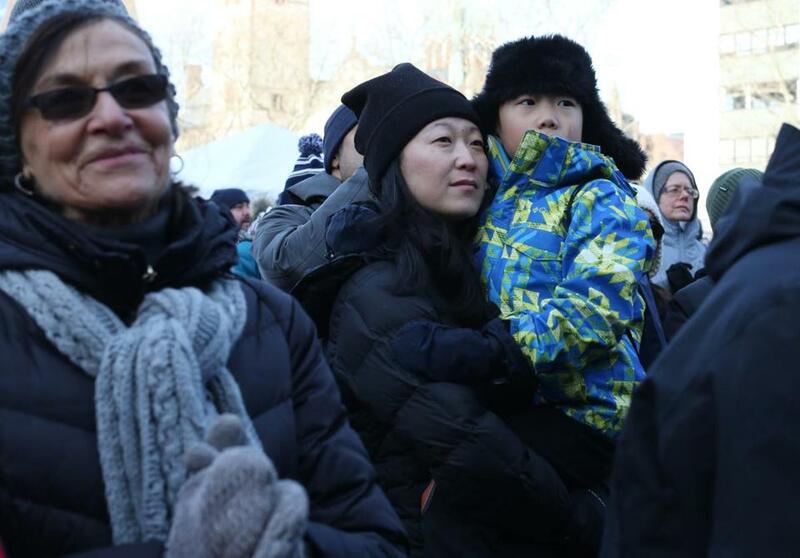 Forkey, who said she has participated in all three Winter Walks, stood in subfreezing temperatures Sunday morning with other participants bundled up in thick coats and clutching handwarmers before setting off on the 2-mile walk around Boston Common. Ari Barbanell, the event’s executive director, said the walk takes place in February to demonstrate the hardships that homeless individuals face during the winter. “We wanted to raise awareness around the issues of homelessness, and we thought that in the coldest month of the year, walking outside would be a way to spend just a few moments in the shoes of people experiencing homelessness,” said Barbanell. All of the event’s proceeds will go to the Winter Walk’s community partners: Boston Health Care for the Homeless, Brookview House, Pine Street Inn, Y2Y Harvard Square, and Boston Medical Center. The walk raised $100,000 in its first year and $140,000 in its second, according to Barbanell, who said she hopes to reach $150,000 this year and fund-raising will remain open through the end of the month. Everyone who registered for the event was asked to raise or donate $100 ($50 for students), but donations were not required, Barbanell said. “We never want it to be a barrier,” she said. John Lane, 49, a Winter Walk volunteer who was homeless for four and a half years, said the walk allows its participants to stand next to each other as equals. “We’re all bundled up so as we’re walking up around the Common and past the State House, you’re not going to be able to tell who slept outside last night, who slept in a shelter, who slept in a home, who slept on a couch, because we’re all dressed the same. We all look the same,” said Lane. One participant had a sign on her back during the walk. 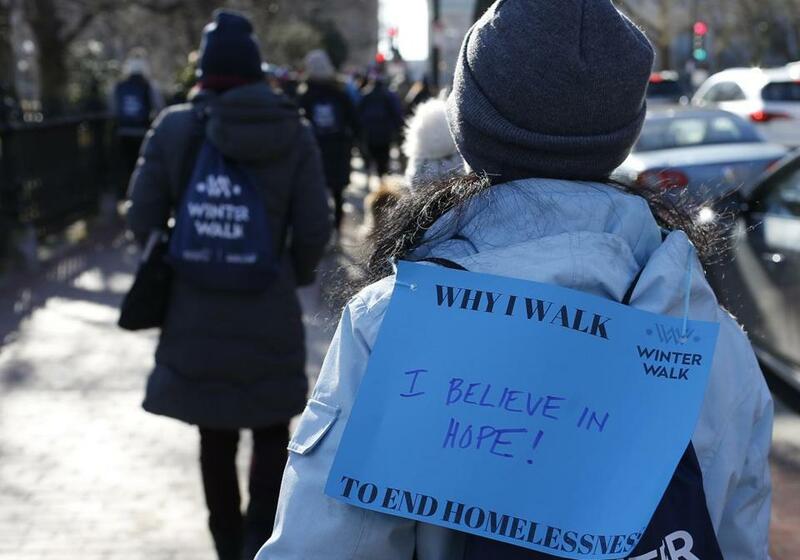 This year, Mayor Martin J. Walsh and City Councilor Annissa Essaibi George gave remarks encouraging the walkers to continue bringing attention to Boston’s homeless population. After the walkers returned, Essaibi George told the crowd that the city council had unanimously passed a resolution that Feb. 10, 2019, would be known as Winter Walk Day in Boston. “This day serves as a reminder that every day we can and must do more to support some of our most vulnerable populations in the city of Boston and beyond,” Essaibi George said. Essaibi George told the Globe after the event that she intends to refile that resolution every year that she sits on the city council. At the end of the walk, participants were given free breakfast sandwiches back at Copley Plaza while they listened to stories from people who have experienced homelessness. Barbanell invited David, a Navy veteran who has been homeless, to the stage to tell his story.